In the sphere of anti-aging, maintaining healthy, clean blood is essential in the effort to prevent disease and the spread of free-radicals. 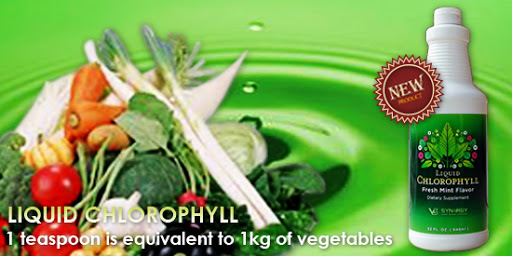 The molecular structure of chlorophyll is almost identical to the molecular structure of hemin, which is a part of haemoglobin, a protein in blood that transports oxygen throughout the body. The only difference between the chlorophyll and the hemin is the fact that magnesium (Mg) is at the centre of chlorophyll, and iron (Fe) is at the centre of hemin. What’s remarkable is that scientists have observed the assimilation of chlorophyll into the body and found that at some point, the magnesium turns into iron. However, they are still baffled as to how the process works – they haven’t been able to yet pinpoint how the switch is made. The best way to get chlorophyll is through juiced or blended greens (with fruit, to mask the taste). The darker the green, the more chlorophyll is present. Hughes, J H, and Latner, A L. “Chlorophyll and Hemoglobin Regeneration After Hemmorhage,” Journal of Physiology, University of Liverpool, 1936, 86, #388. Shaw, C R, Dabney, B and Dr. Chiu-Nan Lai, “Inhabitation of In-Vitro Metabolic Activation of Carcinogens by Wheat Sprout Extracts,” Nutritional and Cancer Journal, University of Texas, 1978. Posted on Hunyo 12, 2014, in Walang kategoriya. Bookmark the permalink. Mag-iwan ng puna.